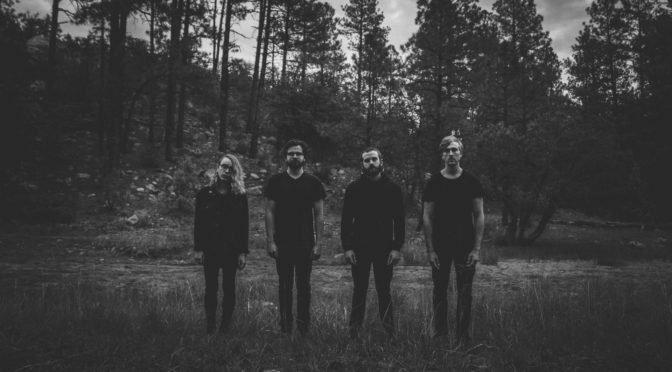 PHOENIX — Holy Fawn, the Phoenix-based band who describe themselves as “four creatures making loud heavy pretty noises, release a video for “Dark Stone” as the band’s buzzed about under-the-radar album, Death Spells, gets a proper release via Triple Crown Records (home to Caspian and Covet). Death Spells initially received a DIY, regional release in 2018, with the band’s friend putting out the 10-song album via his label, Whelmed Records. Word about the young band began to grow out of the Southwest with fans and friends sharing the songs and “Drag Me Into The Woods” video via social media, eventually tipping off a handful of in-the-know writers and musicians. Triple Crown Records re-released the album digitally with the vinyl available via Holy Roar. Los Angeles, CA – Australian alt-pop trio, Chase Atlantic, is pleased to kick off 2019 with a new video for their latest single, “Like A Rockstar.” Co-directed by frequent collaborator, Ryan Watanabe, and lead guitarist, Clinton Cave, the visual captures the band on-the-road headlining shows worldwide, including an impressive sold-out gig at New York City’s Gramercy Theatre this past November. “Like A Rockstar” can be viewed HERE and follows a string of Chase Atlantic music videos that have amassed over 9.2 million total combined views. Watch them all below. Chase Atlantic unveiled “Like A Rockstar” last month, marking their newly-minted partnership between MDDN and BMG. The song hit over 80k Spotify streams in its first 24 hours of release and has already garnered close to one million streams on the platform, in addition to landing on the esteemed New Music Friday playlist. The band was also recently highlighted as Facebook’s Artist of the Day to coincide with the new offering. The track can be streamed and downloaded on all digital retailers HERE. In other news, Chase Atlantic’s forthcoming EP, Don’t Try This, will be released this month, with more details to be announced soon. The group is also currently working on their sophomore album, serving as a follow up to their successful self-titled debut (2017) and two independent EPs, Dalliance (2014) and Nostalgia (2015). Los Angeles-based five-piece The Crown Remnant recently announced the upcoming release of latest conceptual opus, The Wicked King: Part II, available for pre-order now via Amazon, iTunes, Google Play and Bandcamp. Pre-orders are available with “Inferno” as an instant-grat download. You can also pre-save the album via Spotify HERE. The Wicked King: Part II, takes the listener on a dramatic, energetic joyride from start to finish! Today, The Crown Remnant have revealed a brand new guitar playthrough video for their latest single, “Inferno“. Watch the video, featuring the skills of guitarist Will Ash, now alongside an interview via PureGrainAudio.com‘s Geared Up HERE. You can now watch two additional new videos from The Crown Remnant, including a live footage music video for “Inferno“, as well as part one of the band’s behind-the-scenes track-by-track video series, detailing the album’s intro track, “Into the Depths“. The Crown Remnant have mastered the art of melodic, theatrical, yet hard-hitting heavy metal, and the world is about to take notice. Combining a variety of metallic influences ranging from modern metalcore and prog, thrash and more, The Wicked King: Part II acts as the second part of the band’s previous release, The Wicked King: Part I. Within the first month of its release, The Crown Remnant garnered over 10,000 streams of their first single cut from The Wicked King: Part I, entitled “Haunted“. The band plans to follow suit and beyond with The Wicked King: Part II. The Wicked King: Part II is loosely based on thematic concepts of oppression and tyranny. Originally recorded as one long album, the band decided to split it into two releases – with The Wicked King: Part II acting as the “darker” side of the two. Part II addresses tales of betrayal, mortality, exploring the afterlife and more. Intertwined within these ideals are scattered lyrics pertaining to the character designed on the front cover of the album: The Wicked King. He remains an everlasting shadow of a forgotten king set on immortality, with his insatiable lust for never-ending life. The Wicked King: Part II was recorded in multiple studios throughout Southern California, with the help of S&W Audio, and producer/engineer Tyler Ruehl (Noble, At The Skylines, Taipan, Lion I Am). After a rigorous tracking process, the songs were mixed by Robin Leijon (In Dying Arms, Atena, Eternal Void). The Crown Remnant will hit this road this winter for select tour dates! See below for a list of all confirmed tour stops. Technical metal icons Gorod have released their brand new 10-track album, Aethra, today via Overpowered Records! The album can be ordered digitally via Amazon, iTunes and Google Play, and in several physical formats via Overpowered Records‘ merchandise site HERE. In celebration of today’s release, Gorod have revealed an epic, cinematic music video for the track “Bekhten’s Curse”, produced by Disclosure Productions and available to view now via Revolver HERE. As a live band through and through, Gorod plan to bring their trademark power and precision to North America on a full tour in support of Aethra. 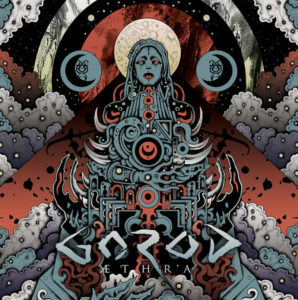 Before coming to the states, Gorod will tour in Europe and the UK with headliners Beyond Creation, as well as fellow support artists Entheos and Brought By Pain. 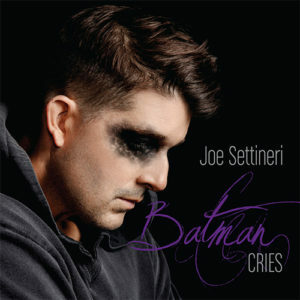 American Singer/Song-writer Joe Settineri has released the official music video for his deeply moving new single, “Batman Cries.” Originally premiered on CelebMix, “Batman Cries” was directed by Jared Cordes. 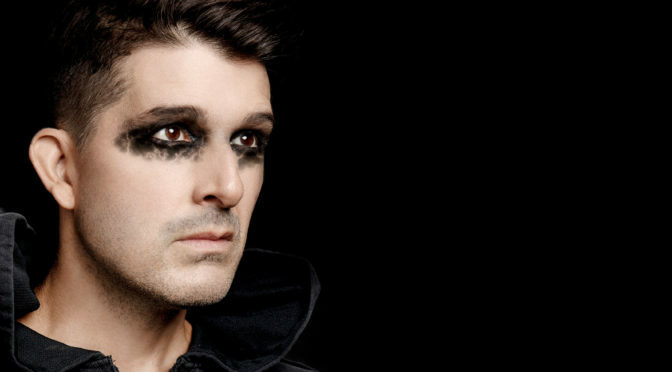 Originally from the mid-west, Los Angeles based singer songwriter Joe Settineri was a late bloomer. After the music world wooed him away from a finance career, and years spent being one of a handful of go-to singers in Los Angeles, Settineri established himself as an exceptional singer-songwriter in 2009 with his widely praised first studio album, Stay (LML Records). His second full studio album, Beyond Your Control , was released 2014 and followed up by his most recent EP, Be The One in 2017. 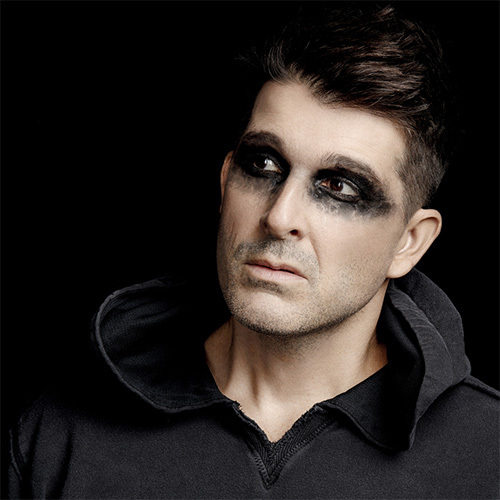 Joe’s newest singles, “Hello Goodbye,” “Batman Cries,” and “Oxygen,” all collaborations with multi-platinum Nashville-based producer Mike Krompass (Smash Mouth, Nellie Furtado), are slated for release in Summer and Fall 2018. Joe lives in Los Angeles with his husband and two children. UK-based progressive rockers Francesco Fonte Band have released a new music video for “Universe Garden“, the third song from their new album Eight . 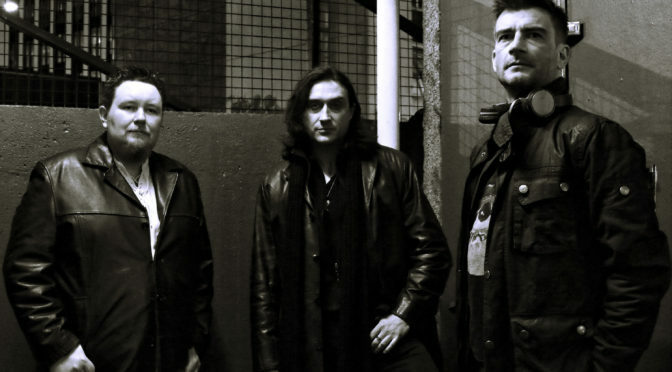 With this song the band recalls 80’s goth and dark rock in a poetic and driving track. The music video features black and white cinematography following a young woman in her journey of the “Universe Garden“. The video was shot by Torturett Photography in Hampstead Heath, London. Watch the new video HERE. Francesco Fonte Band formed in the UK in 2011. Previous releases were debut album Blue Omens (2011) and the EP Arousal Addiction (2013). Both records were reviewed by many webzines and magazines all over the EU. The same year as their latest release, they performed more than twenty successful shows in some of London’s best music venues. The band also achieved numerous airplays from radio stations (K2KRadio, VirginRock, ClassicRock and Bcfm-Bristol). The new album Eight was released via NMTCG records. 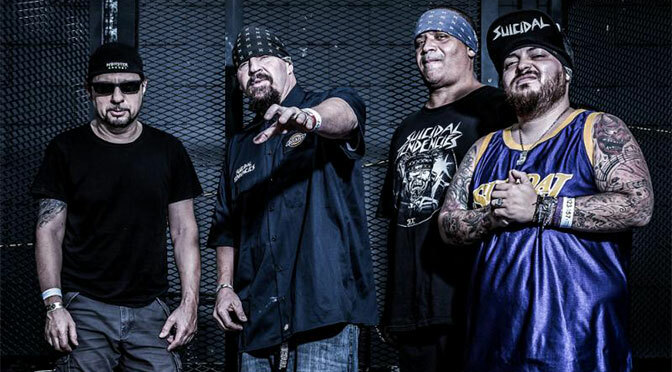 Vocalist Mike Muir‘s relationship with Converse started long before Suicidal Tendencies. “When I was young, I still remember getting my first pair of ‘Chucks’ for my birthday and how stoked I was to wear them to school the next day,” says Muir, reflecting on the iconic sneaker. “It was almost like a rite of passage, the beautiful thing about them is whatever ‘direction’ you were headed, you could go there with your Chucks. 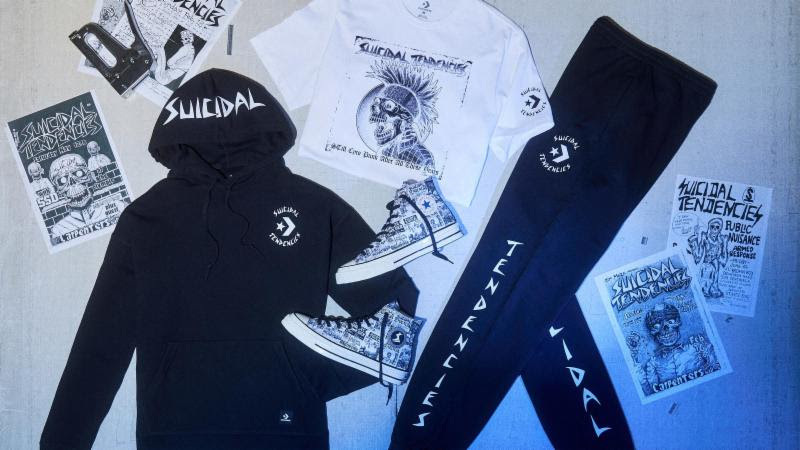 Converse x Suicidal Tendencies is a collection of Chuck 70’s and accompanying apparel based on digital and screen-printed graphics in the classic style of Ric Clayton, who designed posters and fliers for the band back in the ’80s. The Chuck 70 HI’s vintage canvas upper features an all-over digital print and the Suicidal Tendencies leather patch on the lateral side. An Ox version, comes in black with an all over digitally-printed lining. The Suicidal Tendencies logo is printed on the tongue and heel. Both the Hi and the Ox pair feature two sets of additional laces including a Suicidal Tendencies printed logo lace. STill Cyco Punk After All These Years will be available in digital, CD, opaque purple vinyl (with download card) and opaque gold vinyl (with download card, patch and poster) formats. All merch and physical formats can be pre-ordered via the official webstore, and digital formats can be pre-ordered via iTunes and Amazon. You can also pre-save the album via Spotify, Apple Music and Deezer here. New Jersey-based progressive metal quartet Etherius are thrilled to release their remarkable new instrumental progressive metal EP, entitled Thread of Life, today. The impressive new five track offering is available to order now via Amazon, iTunes, and Google Play. You can also stream it now via Spotify. 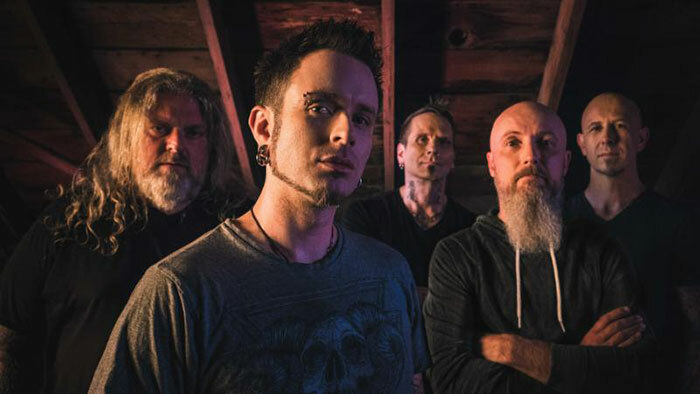 In celebration of today’s release, Etherius have revealed a brand new music video for their barnburner track, “March and Defy”, filmed/directed/edited by Michael J Adams of Blackline Studios and recorded at High Tor State Park, NY. The new video for “March and Defy” introduces new guitarist Jon Perkins, stepping in for former guitarist John Kiernan. Perkins originally hails from São Paulo, Brazil, and brings a strong a jazz guitar and classical composition background into the fold, accelerated by his studies at both UMiami’s Frost School of Music and Columbia University. He came in contact with the members of Etherius after performing with drummer Zaki Ali in guitarist Gus Sinaro’s backing band. 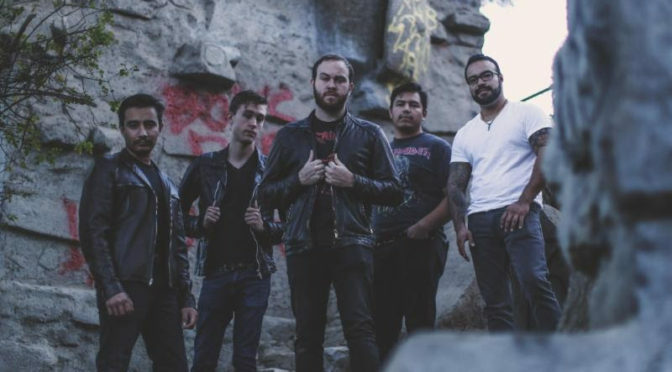 Etherius was formed by guitarist Jay Tarantino in 2017. After gaining experience as a touring rhythm guitarist for guitar virtuoso Angel Vivaldi, Tarantino decided to branch out on his own with the goal of making music unlike the djent/electronic stylings of the current instrumental guitar scene. The result is Etherius – a fresh new take on progressive metal/neoclassical shred incorporating classic thrash elements. Etherius features lead guitarist Jay Tarantino, drummer Zaki Ali, bassist Chris Targia and second guitarist Jon Perkins. 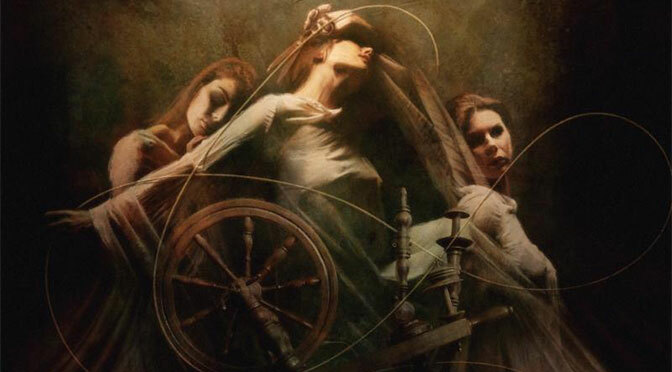 The concept of Thread of Life and the album’s artwork were inspired by ancient Greek mythology, specifically TheMoirai (moy-ray), or “three fates”. Thread of Life was produced and engineered by Jay Tarantino and Zaki Ali with Angel Vivaldi acting as co-producer, was recorded at Backroom Studios in Rockaway, New Jersey (owned by Dillinger Escape Planguitarist Kevin Antreassin), and was mixed/mastered by Mutiny Within vocalist Chris Clancy at Audioworks Productions. Additional tracking was completed with Angel Vivaldi at his home studio. 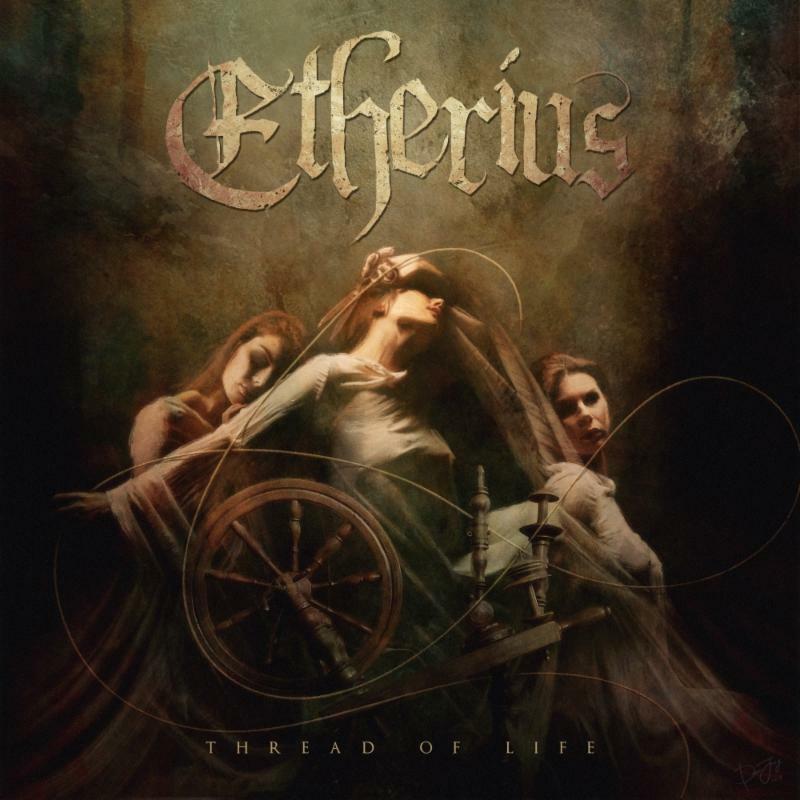 With one listen to Thread of Life it’s clear that combined, the four extremely talented musicians of Etherius produce a clean, awe-inspiring sound merging powerful progressive elements that will appeal to not only the most discerning and critical metal fans, but to the heavy music-loving masses as well. Etherius are currently endorsed by Kiesel Guitars. Los Angeles, CA — Dance Gavin Dance frontman, Tilian Pearson, is excited to share his new single, “Cocky,” out today via Rise Records. The track is an upbeat, infectious alt-pop anthem, bound to be a staple on summer playlists. 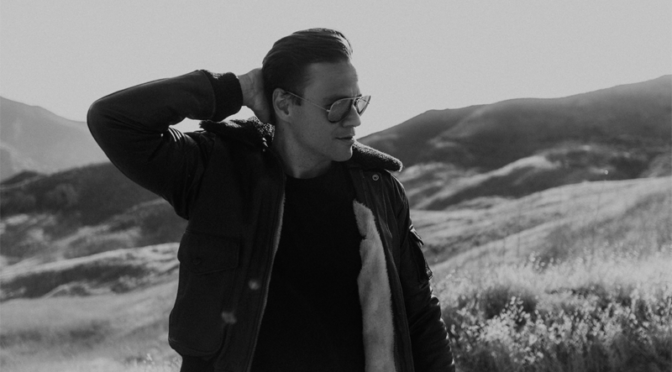 The accompanying music video is also out today, which features Tilian and his love interest on a picturesque road trip throughout San Bernardino and Crestline, California. Watch it HERE. Tilian is also pleased to announce that his third full-length studio album, The Skeptic, is due this fall, confirmed for release on Friday, September 28th. The record is rounded out at 10 tracks and complete with a solid mix of pop-punk and indie-pop offerings. Fans can pre-order it HERE. “Musically and in my personal life, I kept thinking, ‘I’ve got to find and explore some new ground,’ ” says Tilian. “I’ve always been so much more questioning than most people around me are. I never really bought into things the way 90% of the crowd does. That sentiment communicated the idea of The Skeptic to me,” he adds. After touring non-stop with DGD, Tilian will head back out on the road next week, kicking off his North American headline dates at San Francisco’s Brick & Mortar on Thursday, August 23rd. The stint hits notable stops in Los Angeles, Atlanta, Nashville, Philadelphia, Brooklyn, and Toronto, before wrapping in Denver on Sunday, September 23rd. Former DGD vocalist, Kurt Travis, will provide direct support with his new band, Royal Coda, along with Sunsleep and another special guest (TBA). Tickets and VIP packages can be purchased HERE, and a full itinerary is included below.